State media begin to feed a budding personality cult around Kim's youngest son and heir, hailing him as a "lighthouse of hope." PYONGYANG, North Korea — North Korea displayed the body of ruler Kim Jong Il in a glass coffin surrounded by red flowers today, and his young heir was one of the first to pay respects – a strong indication that a smooth leadership transition was under way. Kim’s body was wrapped in red cloth and surrounded by blossoms of his namesake flowers, red “kimjongilia.” As solemn music played, Kim Jong Un — believed to be in his late 20s — entered the hall to view his father’s bier, surrounded by military honor guards. He observed a moment of solemn silence, then circled the bier, followed by other officials. Outside one of the capital’s main performance centers, mourners carried wreaths and flowers toward a portrait of Kim Jong Il. Groups were allowed to grieve in front of the portrait for a few minutes at a time. The announcement Monday of Kim’s death over the weekend raised acute concerns in the region over the possibility of a power struggle between the untested son and rivals, in a country pursuing nuclear weapons and known for its unpredictability and secrecy. But there have been no signs of unrest or discord in Pyongyang’s somber streets. Kim’s bier was decorated by a wreath from Kim Jong Un along with various medals and orders. 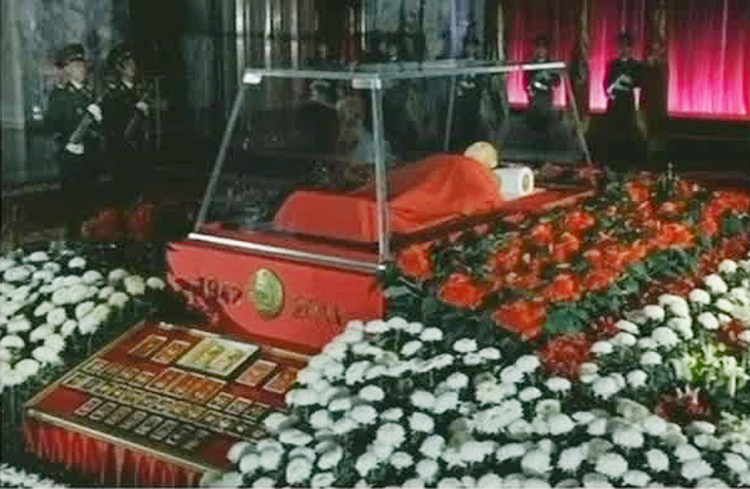 The body was laid out in the Kumsusan Memorial Palace, a mausoleum where the embalmed body of Kim’s father — national founder Kim Il Sung — has been on display in a glass sarcophagus since his death in 1994. Kim Jong Il died of a massive heart attack on Saturday caused by overwork and stress, according to the North’s media. He was 69 — though some experts question the official accounts of his birth date and location. The state funeral for Kim is set for Dec. 28 in Pyongyang, to be followed by a national memorial service the next day, according to the North’s state media. North Korean officials say they will not invite foreign delegations and will allow no entertainment during the mourning period. Since Kim’s death the media have stepped up their lavish praise of the son, indicating an effort to strengthen a cult of personality around him similar to that of his father and — much more strongly — of Kim Il Sung. The Korean Central News Agency on Tuesday described Kim Jong Un as “a great person born of heaven,” a propaganda term previously used only for his father and grandfather. The Rodong Sinmun, the newspaper of the ruling Workers’ Party, added in an editorial that Kim Jong Un is “the spiritual pillar and the lighthouse of hope” for the military and the people. It described the twenty-something Kim as “born of Mount Paektu,” one of Korea’s most cherished sites and Kim Jong Il’s official birthplace. On Monday, the North said in a dispatch that the people and the military “have pledged to uphold the leadership of comrade Kim Jong Un” and called him a “great successor” of the country’s revolutionary philosophy of juche, or self reliance. But concerns remain over whether the transition will be a smooth one. South Korea put its military on high alert, and experts warned that the next few days could be a crucial turning point for the North, which though impoverished by economic mismanagement and repeated famine, has a relatively well-supported, 1.2 million-strong armed forces. South Korea offered condolences to the North Korean people, but the government said no official delegation will be traveling from Seoul to Pyongyang to pay their respects. Kim’s death could set back efforts by the United States and others to get Pyongyang to abandon its nuclear weapons ambitions. Concerns are also high that Kim Jong Un — being young and largely untested — may feel he needs to prove himself by precipitating a crisis or displaying his swagger on the international stage. Kim Jong Il was in power for 17 years after the death of his father, and was groomed for power years before that. Kim Jong Un only emerged as the likely heir over the past year. “The sudden death of Kim Jong Il has plunged the isolated state of North Korea into a period of major uncertainty. There are real concerns that heir-apparent Kim Jong Un has not had sufficient time to form the necessary alliances in the country to consolidate his future as leader of the country,” said Sarah McDowall, a senior analyst with U.S.-based consultants IHS.